It was such a comfort to know that I am not the only one who struggles with fabric measurements. But after reading Beverly's comment and printing out her list, I feel like I've been set free. I should have asked you all before, but I was a bit embarrassed. With conversions in hand, I remeasured my fabric and labeled it. Then I made up a little fabric chart and started cutting. Needless to say, things went much smoother and I didn't have to wonder if I was cutting up the wrong fabric. Knowledge is a wonderful thing! I learned a valuable lesson too, just ask. I don't think I'll be working in a fabric store anytime soon though, who knows what I'd cut for a customer! 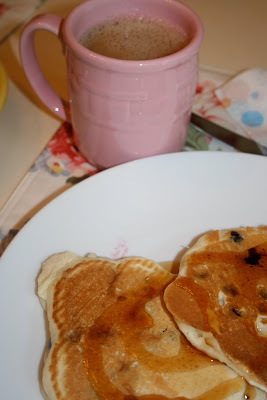 With too many fresh blueberries on hand I decided to start the day with blueberry pancakes. My daughter had a good buddy sleep over so they really enjoyed the overabundance of fruit. I'm dropping off my sewing machine to be serviced today. I feel like I'm dropping off my child at Kindergarten with all my separation anxiety. It's been running so slow that soon enough it will be faster to hand-sew (ugh!). Hopefully I'll get alot of fabric cut today. Have a wonderful day! So glad you asked. I went back and read Beverly's comment. Great info! Can't wait to see the quilt as it progresses along. Glad someone helped you out with the measurements. The pancakes look so yummy good. I made BB muffins! So good with a sugar lemon glaze on top! Hooray for blog frinds who help us out:>)Hope your machine isnt in the shop too long, I know I would be antsy without mine! I was happy to be of help. Ohhh! those pancakes look so yummy. Be sure to show us the progress of that quilt. Funny...I am taking my machine in today too. I have a backup, but will miss my baby. "A Serviced Machine, is a Happy Machine"
Anyway...I too, really need to take mine somewhere to be cleaned. It produced a lint ball the size of a watermelon yesterday!